PT. 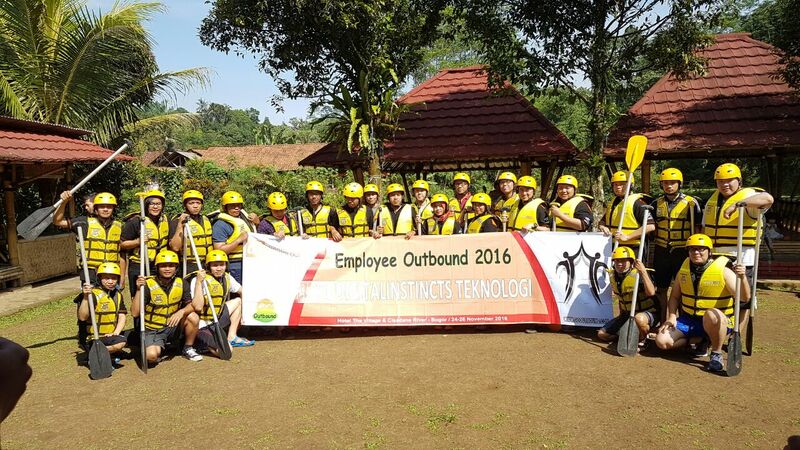 DigitalInstincts Teknologi conducted a joint event or commonly called “Outing” held between 24th – 26th November 2016 at The Village Villa, Sukabumi. This event were aimed to refresh and rejuvenate team spirits. The participants were very enthusiastic throughout the series of events, ranging from games, door prizes, rafting to wading Cisadane River and also various games that hone teamwork. Even the rain couldn’t break the spirit and enthusiasm of the participants to participate until the event is over. This event will be held regularly every year and in 2016 this is the first DIT Outing as well as to commemorate the 4th anniversary of PT. DigitalInstincts Teknologi. Outing were held to prove the consistency of PT. DigitalInstincts Teknologi as a company which has the principle of the family to improve human resources as PT. DigitalInstincts Teknologi family. DIT outing as a means find the seeds of a leader, a means of recreation to foster a sense of togetherness, as well as being an interdepartmental mutual. Various games have been prepared by the committee. games prepared aims to hone skills, cooperation and especially to find the seeds of the leader of the of participants. With the spirit of togetherness, of participants are welcomed a series of games that exist. Playing a session attended by all of participants, including the Board of Directors of PT. DigitalInstincts Teknologi, on the basis of equality of participants during among the activities. Outing aims to build intimacy and togetherness and forgetting status in the workplace, the equality of status has been approved by the CEO and the board of directors there. On the first day, DIT Outing was opened with a welcome from the CEO of PT. DigitalInstincts Teknologi, Mr. Kenny Marchel who shared the successful history of PT. DigitalInstincts Teknologi that has stood since 2012 until now. Candles were blowed and cake were cut to celebrate the 4th Anniversary of PT. DigitalInstincts Technologi. After the opening ceremony, outdoor games session begins. When the outdoor games session, rain started to pour but that was not a reason for participants to not following the games. The games was more exciting in the pouring rain. First night Outing closed with a talent show, door prize and awards to the best employee in 2016. Talent show of participants are all employees who want to show the talent both appeared together in the form of group or solo performances. Participants talent they were preparing talent with mature. Various performances interestingly makes overwhelmed the juries to determines the winner. And the winner of DIT talent will get Carrefour shopping voucher worth 1.500.000 IDR, door prize winner will get sophisticated and branded earphones and the Best Employee 2016 will get Carrefour shopping voucher worth 1.500.000 IDR as well as an award certificate. On the second day we still do outdoor games but different kind with the first day. In the morning, we return divided into four groups. This time, we must fight lifting weapons and shoot into another group. But do not worry because the bullets that we used is different with the bullets which used by soldiers on the war zone, but the bullet which was used is a paint ball bullets. Although the bullets that we used are only the paint, we shall remain safety. We are not allowed to remove google full face during in battle field. Although this paintball game only lasted 10 minutes, but this session was very exciting and fun. In the afternoon we did village tracking and visit to soy milk factory, Soylicious. After that, we were given a long time to rest and prepare a presentation for the Business Plan 2017 which will be held in the night at 20:00 p.m.
We are at the end of the event, before we go back to our respective homes, we cross the Cisadane River (Rafting) and flying fox freestyle challenge. Who has the best style when flying will get a prize of shopping vouchers at 400.000 IDR for the winner, 300.000 IDR for the runner up and 200.000 IDR for 3rd. Thank you for BOD PT. DigitalInstincts Teknologi, who always support all of part the event and also all participants who join in this outing. And without to forgot to say thank you so much to committee who always handle and make this event to be success. Hopefully PT. DigitalInstincts Teknologi more success and solid. See you in Outing DIT 2017.